For many years, I have worked with encaustics – using a wax technique to build texture while at the same time adding an antique look to whatever project I’m working on. Although I’ve used this medium in variety of projects, it wasn’t until recently that I’ve focused more upon using encaustics to take a more prominent role in the works that I am creating. There is a certain look that can only be created with encaustics that can’t be replicated using faux techniques. Working with encaustic is not the fastest process and does require patience that isn’t always first nature to artists or those who demand immediate results. There is a beauty in this process – learning to enjoy the process, meaning that you become closer to your work because of the extra time spent IN the process itself. Because working with this medium can be a bit unpredictable, it adds a new dimension to the creative process that can truly make the project organic. Working with encaustics means that (generally) a more stable ground is needed as the base for the project. For Atelier I cut a 12 x 12 birch wood base. After priming the board, I began adding washes of acrylic paint to build the foundation for this project. Once dried, I adhered a vintage suit jacket pattern over the the entire background. I was not concerned with keeping the thin tissue “perfect” while applying it to the wood panel simply to add more texture. I’ve always felt that texture added to a piece is sometimes more important than the other elements (such as found objects) that are added. It provides so much more depth and another dimension to the project. For Atelier I wanted to to enhance the background that I’d created, so I decided to crackle the entire background. At least in my working experience, there is no good way to speed up the drying process of crackle to give that rich, crackled texture. So after applying a thick layer of crackle paste, I simply had to be patient and let it set over night. But the results are so stunning! The next step in creating the background was to add additional texture by the encaustic process. The short video above shows just part of the process of adding the hot wax to Atelier. There are a variety of different methods for applying wax to a project, and I’ve found a simple way of applying the wax from cutting down my own brushes from Home Depot and melting my wax to just the right temperature in a mini crock pot that I purchased from a thrift store that just happens to heat the wax to the perfect temperature. Since I mostly work in “clear” wax, I’ve found this is the ideal set up for myself in my studio. Above you will see a few close up snap shots of the background after the wax had cooled, resulting in a slightly opaque finish over the crackled background. For this piece I applied three layers of wax, adding oil pastels that had been hand rubbed into the texture created by the wax to add more depth to the layers of wax. As this project evolved, so did the imagery and found objects that would be added to this piece. Since I used the suit pattern as the background of the piece, I began thinking about clothing and fashion which of course made me think of the fashion capital of the world, Paris. With this theme in mind, I started thinking about what I would add to this piece. I had already decided that I wanted to use this metal piece (with the window cut out) that I had found at an antique store, so I began to look for some imagery to go over this and stumbled upon some printed tissue – and created my own stamped tissue that I layered with wax to build the multi-layered collage. 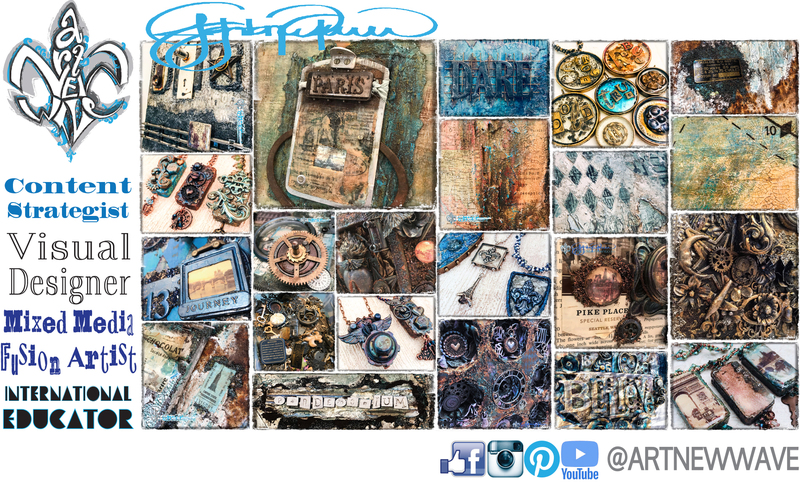 The metal piece was layered onto a piece of colored and textured upcycled cardboard. The cardboard used some of the same colors I used in creating the base layer of this piece. I had debated about adding wax onto the corrugate, but decided that I liked the contrast of the raw texture against the encaustic background. Under the window of the metal piece is a vintage, hand colored image of the Eiffel Tower. Layered on top of the collaged metal piece is a bezel set with resin, held in place with hand dyed Sari ribbon over the naturally rusted metal mesh. I love the juxtaposition of the different textures – the softness of the ribbon against the metal mesh. These layered elements are “held” into place with the antique pair of calipers that I found on a weekend road trip. I’d had these calipers in my stash for a few months, and I had been waiting for the perfect project to incorporate them into. I felt that the natural rust finish led perfectly to this project!